Northern Michigan is filled with so much to see and do. This is the place that is often called "God's Country" because it is so gorgeous. Our many lakes, trails, vistas, parks, and small towns are inviting year 'round. We have many Up North Specialties that indeed make us special. From a planked whitefish dinner to Blissfest Music Festival to the historic Bay View Association to Bay Harbor to the Little Traverse Wheelway, Northern Michigan is filled with so many wonderful opportunities. What makes Up North special? 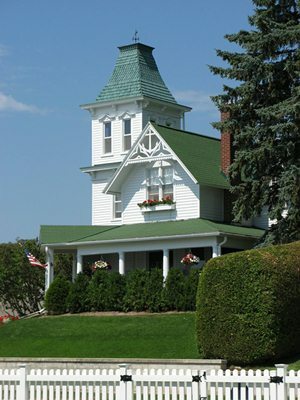 Castle Farms in Charlevoix is a gorgeous setting for an art fair, celebration or garden tour. How about a festival devoted just to spring's morel mushroom, Boyne City's Morel Mushroom Festival. Or a tasty cookie baked in Harbor Springs but known country wide, Tom's Mom's Cookies. What else makes Northern Michigan special? The Heritage Highway between Harbor Springs and Cross Village is spectacular and the Tunnel of Trees is not to be missed. The fall color in Northern Michigan and along the Tunnel of Trees is gorgeous so bring along the camera to capture photos of our Fall Foliage. The newly completed Little Traverse Wheelway connects Charlevoix through Petoskeky to Harbor Springs, a 26 mile bike path, that is drawing bikers from around the country to this scenic part of Michigan. A huge part of what makes Northern Michigan unique--the people who live here. Local residents love Northern Michigan and have chosen it as a place to live, play, work, and enjoy. Customer service is indeed a specialty in Northern Michigan and you will find it at the golf course, ski resort, restaurant, hotel, and our many fine shops. Speaking of shopping, it's often a reason many visitors head Up North! Shopping in Northern Michigan is a wonderful activity. And, of course, we wouldn't be unique without our visitors! Our visitors and seasonal residents love Northern Michigan and it is such a delight to hear someone exclaim "I love it here!"